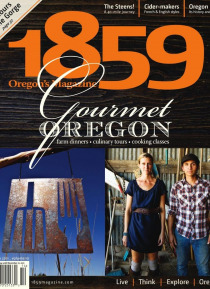 1859 - Oregon's Magazine is a statewide lifestyle magazine named for Oregon's year of statehood. 1859 captures the true Oregon for Oregonians, its admirers and visitors. In an intelligent and beautiful format, 1859 explores the landscapes, the personalities, the movers and shakers, the history and the architecture that is the jewel of the Pacific Northwest.